Another week flew by, with lots of changes in the garden. I apologize for fairly light blogging, but the summer continues at a crazy pace. Yesterday, we had a bunch of kids from McConnell AFB here for a Garden Day camp, so we had a lot of fun, but obviously no blogging got done. 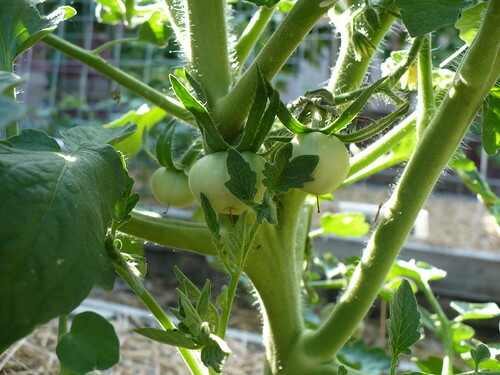 The ‘Marmande’ tomatoes are the first heirlooms to set fruit, and by almost unanimous consent, the kids yesterday said they looked like green pumpkins. They do, rather. 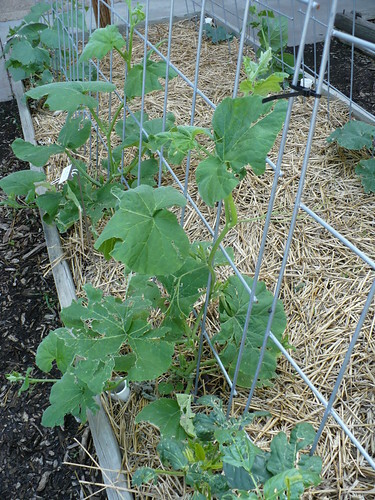 The squash, cucumbers, and melons are doing a great job vining themselves up the trellises. I expected them to take a little more training than they have so far. Even so, I’ve got some clips ordered to help with the trellising, because I expect we’ll need them later. This “bug” is hanging out in our purple kale. It actually is of the Order Hemiptera, which are commonly called “true bugs,” so this is one insect that is correctly called a bug! 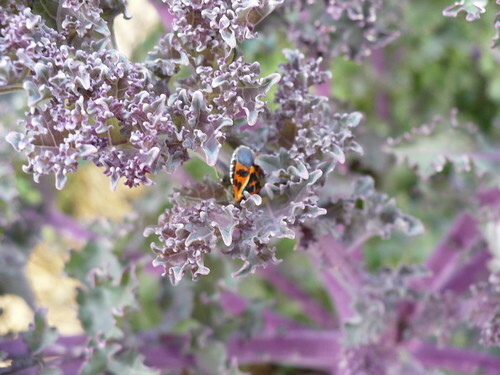 This a Harlequin Bug, which is a pest of cabbage, horseradish, and other members of the cabbage family, which makes sense why it is on the kale. The “Insects in Kansas” book helpfully states, “some people might consider it a beneficial species when it feeds on Brussels sprouts and broccoli.” Gee, thanks! I’m not too worried about the presence of just one harlequin bug, but we’ll keep an eye on it. 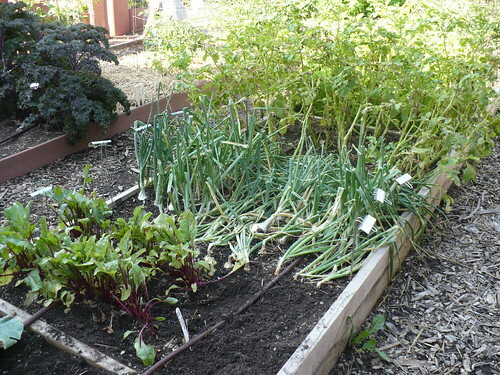 Here’s the Family of 4 Garden before we harvested the onions and potatoes with the kids yesterday. We had a lot of fun digging in the dirt to find potatoes. We could have gotten bigger potatoes by waiting another couple weeks, but it was too much fun to pass up! 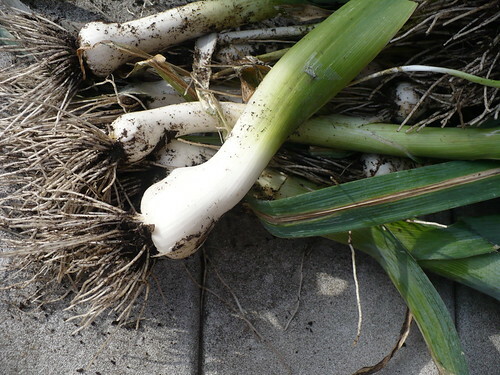 Posted on June 17, 2011, in PhotoEssays and tagged insects, leeks, onions, potatoes, Tomatoes, vines. Bookmark the permalink. Leave a comment.